Celebrate the flavors of the season with this fall inspired quiche! Packed with roasted butternut squash, kale and gruyere cheese, this quiche will make the perfect breakfast or brunch! Preheat your oven to 375 degrees. Prick your pie shell with a fork on the sides and bottom. Add pie weights and bake for about 8 to 10 minutes. Remove from the oven and set aside. Using a skillet over medium high heat, heat the olive oil and, after a minute or 2, add the onions and leeks and sauté for about 4 to 5 minutes. Add the mushrooms and cook until tender, for another 4 to 5 minutes. Add in the kale and season with the salt, pepper and nutmeg. Cook for about 3 to 4 minutes, or until the kale has softened a bit. Remove from the heat. Pour the cooked mushroom and kale mixture into the partially baked pie shell and cover evenly with the roasted butternut squash. Using a medium sized mixing bowl, whisk together the eggs, heavy cream and season with more salt and pepper. Mix in the shredded gruyere cheese and pour the egg mixture evenly over the mushroom, kale and butternut squash. 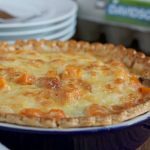 Bake for about 30 to 35 minutes, or until the quiche has browned nicely around the edges and a tester inserted in the center comes out clean. Slice, serve and enjoy.